Facility Administrator is responsible for maintaining and supervising the assigned building and its surroundings. The major area of work focus and duties are highlighted on the Facility Administrator Resume and such include – handling environmental issues, commissioning and supervising repair and maintenance tasks, supervising projects on the facility, planning workspace environment, finding suitable occupants, ensuring that access routes are clear and door openings are functioning well, completing preventive maintenance, negotiating lease terms and resolving conflicts if any. 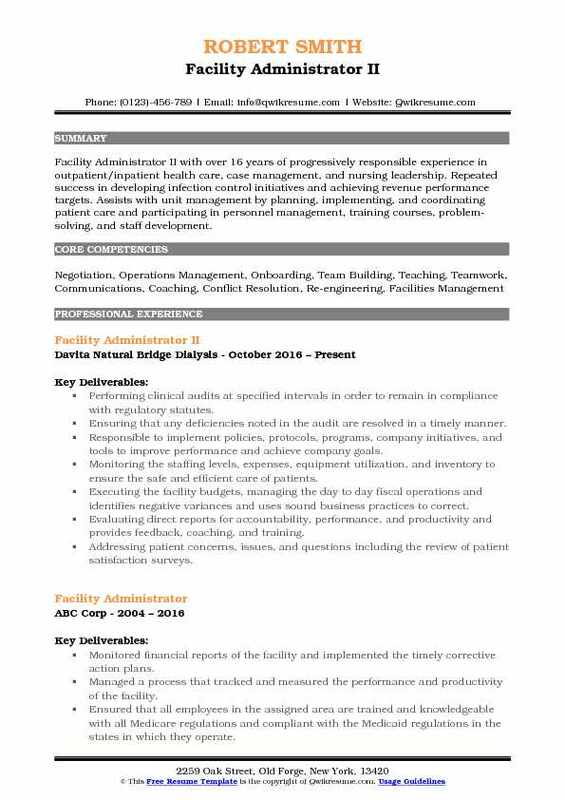 To get into this role, there are certain qualifications and skills that are expected from the Facility Administrator and such include – a very strong communication skill, good networking skills, problem-solving skills, computer competencies, knowledge of facility management, the ability to juggle between various tasks, and exemplary negotiation skills. The minimum level of requirement needed by most of the employers includes a degree or training in Civil engineering or Facility Management. 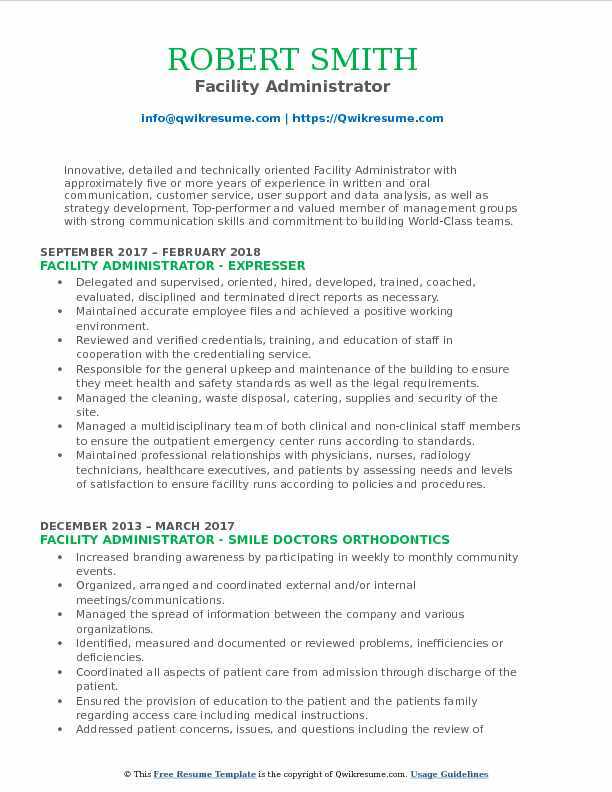 Summary : Facility administrator with extensive experience of 22 years in healthcare and academic areas. 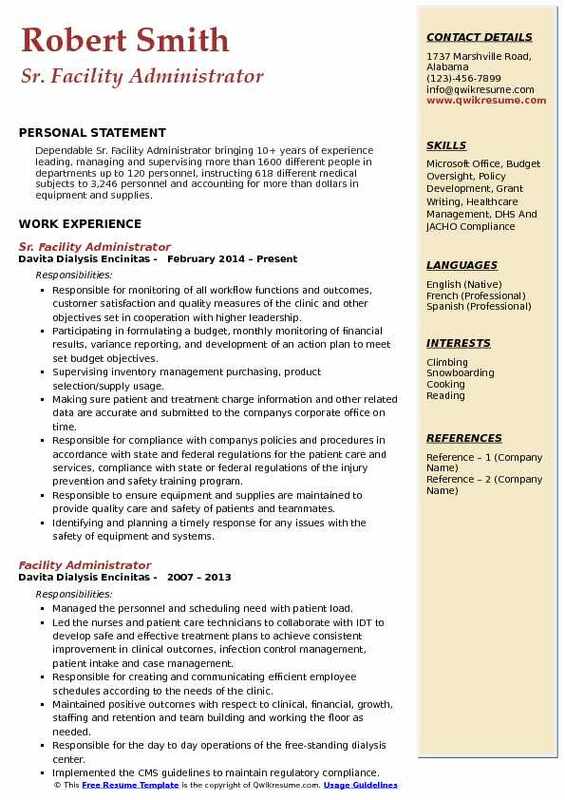 Background includes budgeting, forecasting expenses, communicating with vendors, monitoring patient clinical outcomes utilizing quality metrics in coordination with doctors and nurse, interviewing, hiring, monitor compliance and conducting evaluations. Demonstrated ability to build a strong clinical team to achieve optimal results. Managing the profit and loss and other related financial aspects for the center. Developing and maintaining strong Medical Director and Physician relationships, and facilitating staff. Supporting the quality standards through meetings, regulatory requirements, and the practices of QAI and governing body. Collaborating with the Clinical Coordinator, Charge RN/Nurse Supervisor, Atom, Biomed, DPC Staff, Social Worker, Dietitian, Medical Director, Physicians and Educators regarding the direct patient care responsibilities within the facility to ensure the provision of outstanding quality of patient care. Ensuring the provision of education to the patient and the patients family. Addressing the patient concerns, issues, and questions including the review of patient satisfaction surveys, grievances and report to QAI meetings for quality improvements. Continuously monitoring and reviewing the center operations to ensure compliance with federal and state laws. Ensuring all quality policies and procedures are communicated to and implemented by the facility staff. Summary : Energetic Facility Administrator I with vast experience of 12 years in providing a consistent record of performance in management, operations, sales, merchandising, and product management in the health care, manufacturing, mining and distribution industries. Recognized for developing relationships, hiring, training and leading teams to exceed company expectations. Additional skills in territory management, product presentations, oral and written communications, and negotiating. Developed and maintained a collaborative and energized work environment, ensuring staff satisfaction and minimal turnover rate. Responsible for budget formulation and review and inventory management (including purchasing, product selection and supply usage and cost). Coordinating with the Medical Director to review facility clinical outcomes, water culture results, staffing, and any other facility issues. Developing facility action plans and ensuring resolution of issues. Ensuring the development and implementation of policies, procedures, and resources to help patients assume responsibility for his/her own health. Providing the work direction for nursing, technical, office, and biomedical teammates to ensure high-quality patient care according to company policy. Creating and implementing the corrective action plans as needed as a result of internal or external quality assurance audits, or as required by Medicare, OSHA or other governing agencies. 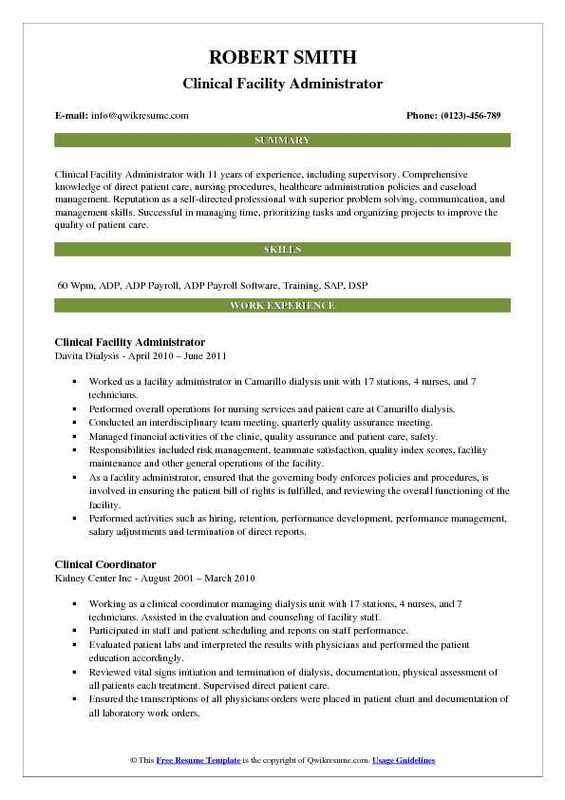 Summary : Clinical Facility Administrator with 11 years of experience, including supervisory. Comprehensive knowledge of direct patient care, nursing procedures, healthcare administration policies and caseload management. Reputation as a self-directed professional with superior problem solving, communication, and management skills. Successful in managing time, prioritizing tasks and organizing projects to improve the quality of patient care. Worked as a facility administrator in Camarillo dialysis unit with 17 stations, 4 nurses, and 7 technicians. Performed overall operations for nursing services and patient care at Camarillo dialysis. Conducted an interdisciplinary team meeting, quarterly quality assurance meeting. Managed financial activities of the clinic, quality assurance and patient care, safety. Responsibilities included risk management, teammate satisfaction, quality index scores, facility maintenance and other general operations of the facility. As a facility administrator, ensured that the governing body enforces policies and procedures, is involved in ensuring the patient bill of rights is fulfilled, and reviewing the overall functioning of the facility. Performed activities such as hiring, retention, performance development, performance management, salary adjustments and termination of direct reports. Supervised inventory management, budgeting, purchasing, product selection and supply usage. Ensured patient and treatment charge information and other data are accurate. Organized staff and patient scheduling and reports on staff performance. Maintaining the overall operational and fiscal responsibilities, provisions of nursing services, and care of patients in several multiple-modality hemodialysis and home program joint-venture facilities. Overseeing a team of registered nurses, dietitians, social workers, patient care technicians, biomedical technicians, and administrative staff members in support of nearly 400 patient daily censuses. Directing and implementing programs, upholding the company core values, and enforcing initiatives set forth by the governing body. Accountable to the governing body on all matters pertaining to the facility. Successfully turned around three underperforming centers by simultaneously recruiting, training, and developing a strong, competent team of professionals, leading to successful 2016 compliance audits by Centers for Medicare. Successfully increased the facility's CMS quality rating from 4-star to the 5-star facility. Implemented strategies to reduce patient admissions time by 50%, down from 48 hours to 4 hours or less. 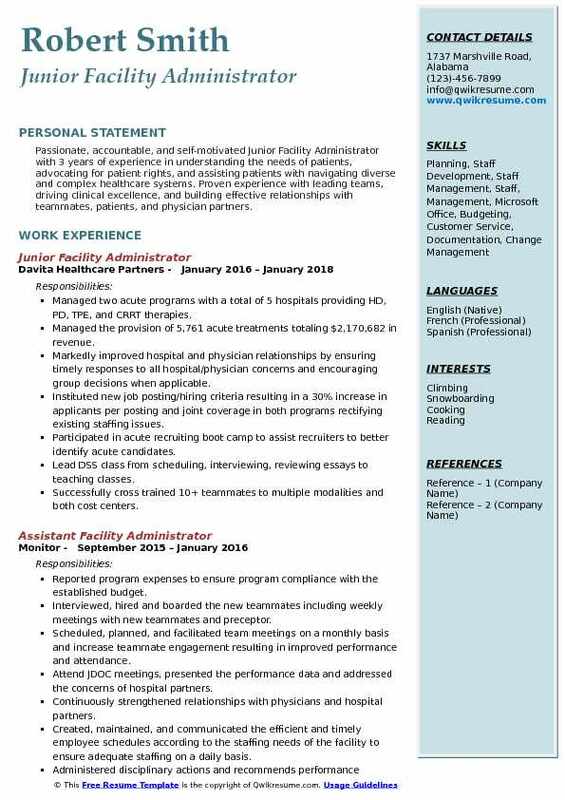 Objective : Passionate, accountable, and self-motivated Junior Facility Administrator with 3 years of experience in understanding the needs of patients, advocating for patient rights, and assisting patients with navigating diverse and complex healthcare systems. Proven experience with leading teams, driving clinical excellence, and building effective relationships with teammates, patients, and physician partners. Managed two acute programs with a total of 5 hospitals providing HD, PD, TPE, and CRRT therapies. Managed the provision of 5,761 acute treatments totaling $2,170,682 in revenue. Markedly improved hospital and physician relationships by ensuring timely responses to all hospital/physician concerns and encouraging group decisions when applicable. Instituted new job posting/hiring criteria resulting in a 30% increase in applicants per posting and joint coverage in both programs rectifying existing staffing issues. Participated in acute recruiting boot camp to assist recruiters to better identify acute candidates. Lead DSS class from scheduling, interviewing, reviewing essays to teaching classes. Successfully cross trained 10+ teammates to multiple modalities and both cost centers. Introduced new star learning process to ensure timely completion of assignments. Streamlined operations to account for alpha operating $111k over budgeted margin. Actively managed teammate performance to ensure issues are addressed early and increase overall team engagement. 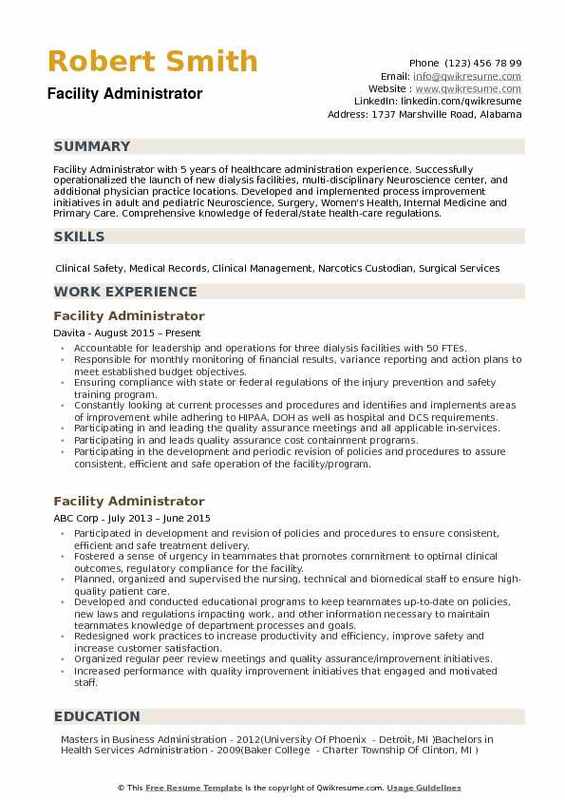 Headline : Talented and results-driven Facility Administrator with tireless work ethic and 5+ years of experience in clinical operations & administration, safety management, and team development. Extensive managerial experience in medical services and training support, exceptional technical acumen for planning and executing large-scale projects safely, on time and on budget. Respected supervisor and leader with broad knowledge of Clinical Management, Safety, and Occupational Health requirements. Served as the Facility Administrator and CEO for a 20 chair dialysis facility with over 90 in center dialysis patients and 23 home dialysis patients, with 22 patient techs and nurses, one social worker, and one registered dietitian. 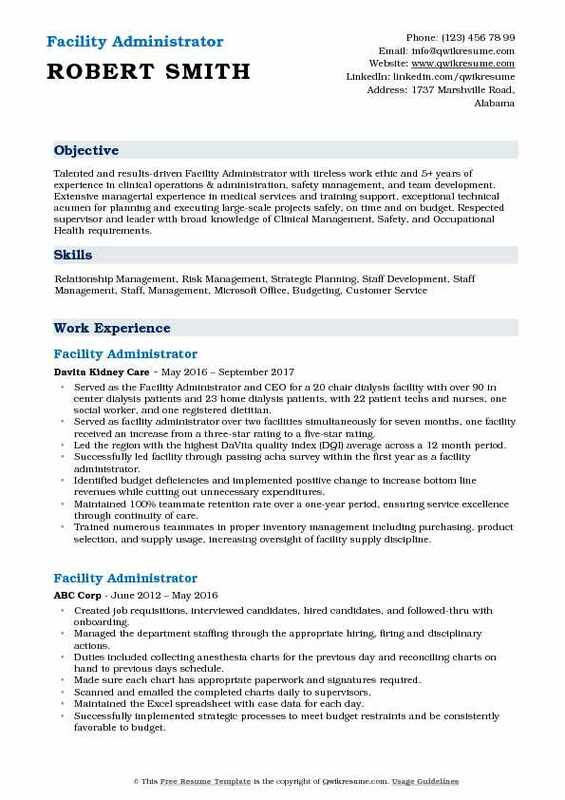 Served as facility administrator over two facilities simultaneously for seven months, one facility received an increase from a three-star rating to a five-star rating. Led the region with the highest DaVita quality index (DQI) average across a 12 month period. Successfully led facility through passing acha survey within the first year as a facility administrator. Identified budget deficiencies and implemented positive change to increase bottom line revenues while cutting out unnecessary expenditures. Maintained 100% teammate retention rate over a one-year period, ensuring service excellence through continuity of care. Trained numerous teammates in proper inventory management including purchasing, product selection, and supply usage, increasing oversight of facility supply discipline. Integrated RNs with administrative assistants in the proper data tracking and entry into the cms database, increasing cms facility rating month over month. Applied DaVita policies and procedures in accordance with state and federal regulations for patient care and services (HIPAA, CMS, OSHA, or other governing agencies). Addressing patient concerns, issues, and questions including the review of patient satisfaction surveys. Headline : Innovative, detailed and technically oriented Facility Administrator with approximately five or more years of experience in written and oral communication, customer service, user support and data analysis, as well as strategy development. Top-performer and valued member of management groups with strong communication skills and commitment to building World-Class teams. Delegated and supervised, oriented, hired, developed, trained, coached, evaluated, disciplined and terminated direct reports as necessary. Maintained accurate employee files and achieved a positive working environment. Reviewed and verified credentials, training, and education of staff in cooperation with the credentialing service. Responsible for the general upkeep and maintenance of the building to ensure they meet health and safety standards as well as the legal requirements. Managed the cleaning, waste disposal, catering, supplies and security of the site. Managed a multidisciplinary team of both clinical and non-clinical staff members to ensure the outpatient emergency center runs according to standards. Maintained professional relationships with physicians, nurses, radiology technicians, healthcare executives, and patients by assessing needs and levels of satisfaction to ensure facility runs according to policies and procedures. Ensured the effective communication with patients and their families, the medical staff, facility contracts/vendor holders, and the billing company. 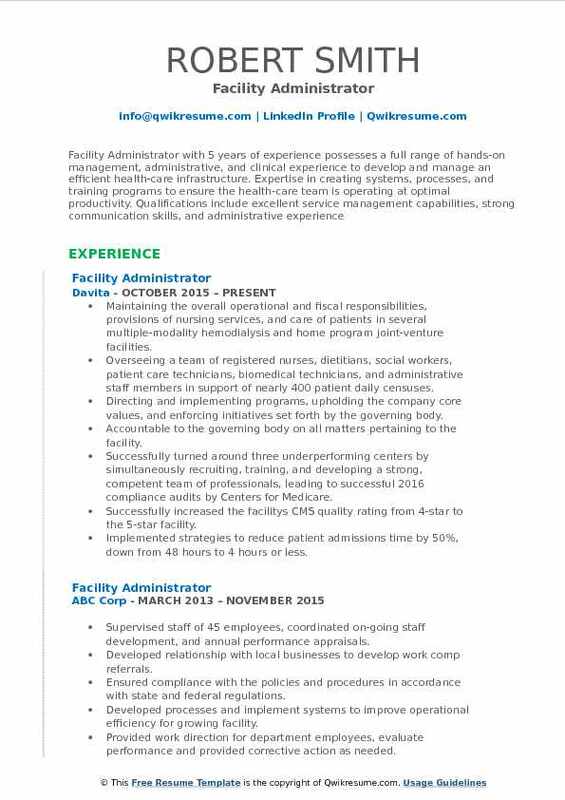 Summary : Facility Administrator II with over 16 years of progressively responsible experience in outpatient/inpatient health care, case management, and nursing leadership. Repeated success in developing infection control initiatives and achieving revenue performance targets. Assists with unit management by planning, implementing, and coordinating patient care and participating in personnel management, training courses, problem-solving, and staff development. Performing clinical audits at specified intervals in order to remain in compliance with regulatory statutes. Ensuring that any deficiencies noted in the audit are resolved in a timely manner. Responsible to implement policies, protocols, programs, company initiatives, and tools to improve performance and achieve company goals. Monitoring the staffing levels, expenses, equipment utilization, and inventory to ensure the safe and efficient care of patients. Executing the facility budgets, managing the day to day fiscal operations and identifies negative variances and uses sound business practices to correct. Evaluating direct reports for accountability, performance, and productivity and provides feedback, coaching, and training. Summary : Dependable Sr. 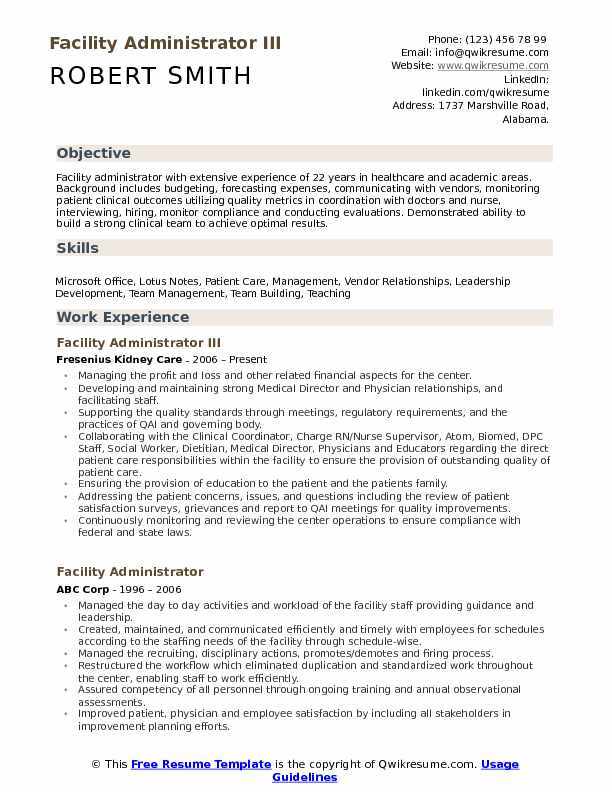 Facility Administrator bringing 10+ years of experience leading, managing and supervising more than 1600 different people in departments up to 120 personnel, instructing 618 different medical subjects to 3,246 personnel and accounting for more than dollars in equipment and supplies. Responsible for monitoring of all workflow functions and outcomes, customer satisfaction and quality measures of the clinic and other objectives set in cooperation with higher leadership. Participating in formulating a budget, monthly monitoring of financial results, variance reporting, and development of an action plan to meet set budget objectives. Supervising inventory management: purchasing, product selection/supply usage. Making sure patient and treatment charge information and other related data are accurate and submitted to the company's corporate office on time. Responsible for compliance with companys policies and procedures in accordance with state and federal regulations for the patient care and services, compliance with state or federal regulations of the injury prevention and safety training program. Responsible to ensure equipment and supplies are maintained to provide quality care and safety of patients and teammates. Identifying and planning a timely response for any issues with the safety of equipment and systems. 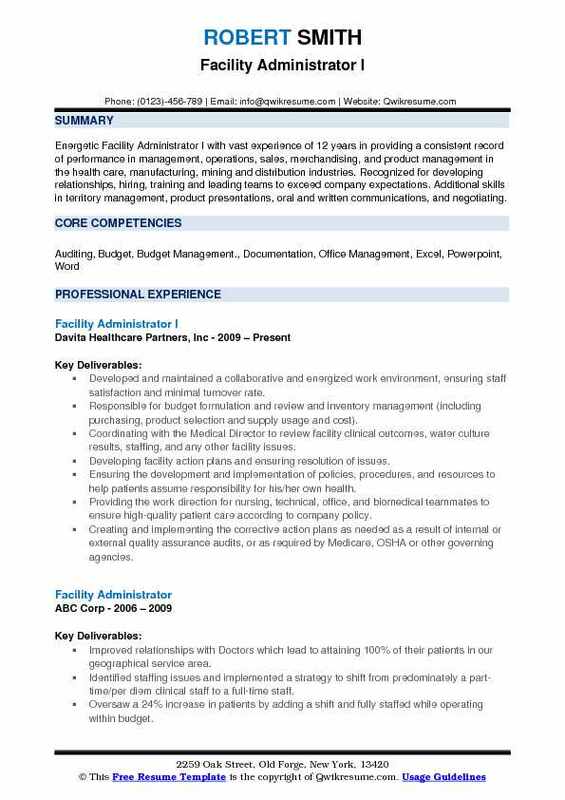 Headline : Facility Administrator with 5 years of healthcare administration experience. Successfully operationalized the launch of new dialysis facilities, multi-disciplinary Neuroscience center, and additional physician practice locations. Developed and implemented process improvement initiatives in adult and pediatric Neuroscience, Surgery, Women's Health, Internal Medicine and Primary Care. Comprehensive knowledge of federal/state health-care regulations. Accountable for leadership and operations for three dialysis facilities with 50 FTEs. Responsible for monthly monitoring of financial results, variance reporting and action plans to meet established budget objectives. Ensuring compliance with state or federal regulations of the injury prevention and safety training program. Constantly looking at current processes and procedures and identifies and implements areas of improvement while adhering to HIPAA, DOH as well as hospital and DCS requirements. Participating in and leading the quality assurance meetings and all applicable in-services. Participating in and leads quality assurance cost containment programs. Participating in the development and periodic revision of policies and procedures to assure consistent, efficient and safe operation of the facility/program.